It’s happened, I’m on ORKAMBI®. may wish to consider either avoiding this article or returning later. It is with mixed feelings I write this post. Today I started ORKAMBI® [orkambi.com], the drug that is targeted at Cfers (A person with CF) with my genotype ΔF508 (Also known as F508Δ.) It is the most common of Cystic Fibrosis (CF) genotypes in the UK, and possibly worldwide. At it’s simplest ORKAMBI® corrects the salt issue which causes CF. People interested in a more medically complete explanation, please look at the ORKAMBI website listed above. What it means for people with CF is fewer infections, as we have less mucus to trap said infection. This reduces the need for IV antibiotics and (in most cases) hospital stays. The reason I am mixed over this is the reason I qualified for ORKAMBI was via a special access program Vertex (The manufacturers) are running in the UK (It may be available in other countries, check with your CF centre.) I won’t reveal the percentages, but lets just say they were in the pits, and whilst I wouldn’t quite win a wooden spoon [Wikipedia], it was very low indeed. Thankfully, in part due to other treatments I was taking, it is starting to improve. How high can it go I hear you say? Well that depends on the individual. The average with ORKAMBI® is 3-5% although some have seen more, especially when they are able to start exercising again and nature kicks in a bit. The highest I’ve heard of went from low 30’s to mid 70’s in terms of percentage. 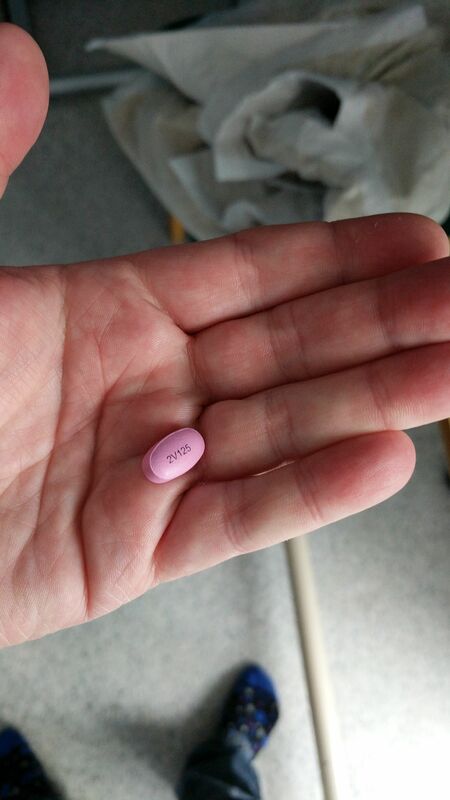 The above shows my first ORKAMBI® dose. I’m on 1 tablet once a day for a week, followed by the full dose of 2 twice a day. I’ll blog occasionally about my progress with it, although I do wish to be sensitive to those who really want it but are not yet able to obtain it due to having too high a lung function. ORKAMBI® is manufactured for Vertex Pharmaceuticals Incorporated. ORKAMBI® is registered trademarks of Vertex Pharmaceuticals Incorporated.